This tribal pattern is somewhat different in a way that I didn't follow the usual horizontal or vertical orientation. Instead, I used mostly curve lines. And I think it made this nail design look more interesting. I wore 2 coats of Dazzle Dry Electrifying as base polish. It has a jelly finish that makes the design pop out. I also chose a basic red color to remain faithful to the color of love. 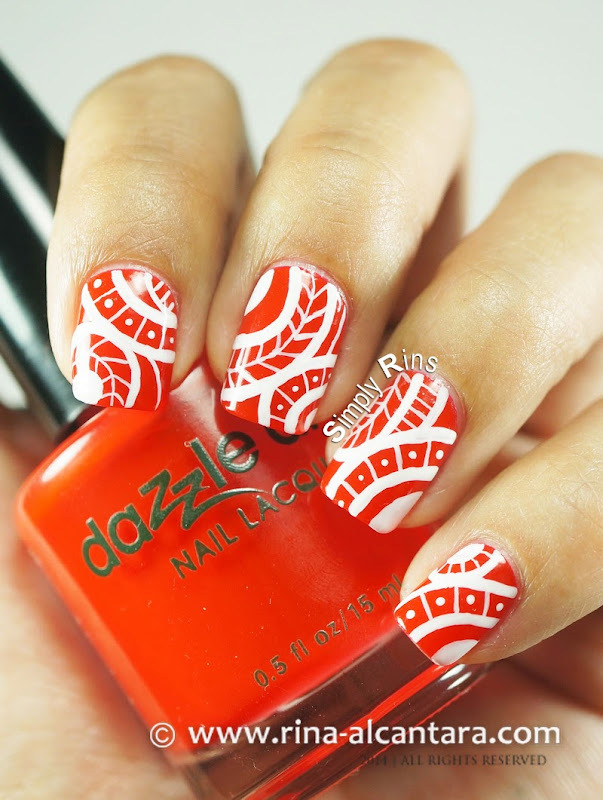 The design was completed freehand using white acrylic paint and a detailing nail art brush. I must admit that painting curve lines was rather difficult, especially while I was working with my non-dominant hand. Times like this, you'll need a manageable nail art brush and a paint with good consistency so that your loaded brush will glide with ease as you paint your nails. It would also help if you water down a little your acrylic paint, more so when you want to paint thin lines. If you noticed, I also used the combination of having thick and thin lines. The finer lines were for the details and the thick ones was used to serve as basis for the overall tribal pattern. It may appear difficult to paint when you look at the photos but it is relatively easy to do. What I do is I hold the nail art brush as how I hold a pen and I make sure that my brush is loaded with the minimal amount of paint on the tip. From a distance, only the thick lines are visible. But a look closer will reveal the details. This makes it more fun for me when people try to take a peek on my nails. It sort of like giving other people a little surprise as they get closer. I had this cheesy idea when I was taking photos of my nail art. I thought of making a heart shape using my hands as a way of greeting all of you a "Happy Valentine's Day!" It didn't come out perfectly shaped, but I hope it will do. 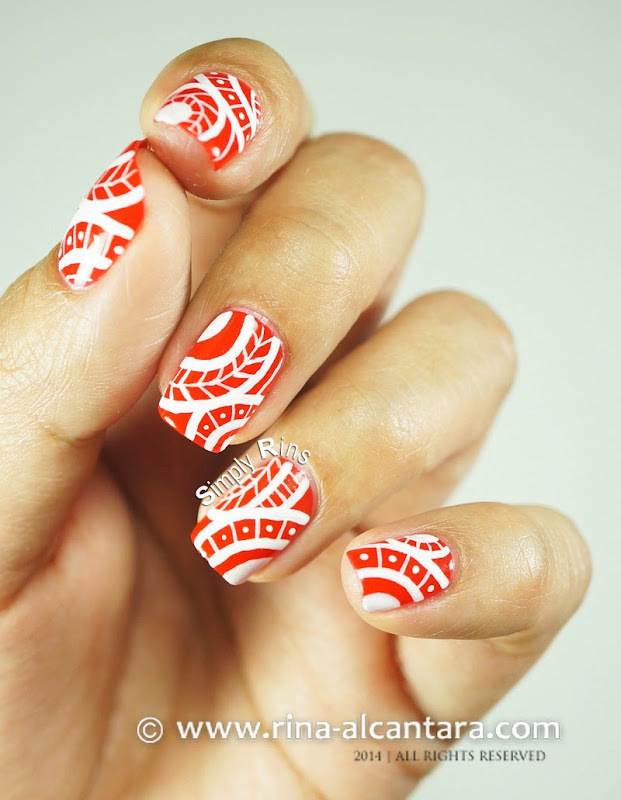 And let me end this post with a video nail art tutorial of how I did this Red Tribal design. Oh yes, I finally had a little spare time to actually film a tutorial on how I paint my nails. Well, I was also encouraged by a gift a certain Panda gave me last year. It's a table tripod that could hold my bulky camera and I can position it wherever I want on the table! Will blog about this cute gadget soon. Still working on the best lighting for videos. And ... I'm still trying to get back my normal skin color. Too much outdoor activities is the culprit. But I hope you liked this Valentine's nail art design and the tutorial. Get crazy and try this with other colors! Is this a thumbs up or a thumbs down for you? This is cute and creative. YAY! This is awesome! I'm sorry I missed it at Valentine's Day!